"I Came Out Here To Have A Good Time And Honestly I Am Feeling So Attacked Right Now" is a meme-phrase originating from the enthralling cesspool that is tumblr. It is, as one may guess, a sarcastic, intentionally dramatic reaction for feigning offense, and is used in situations where offense may not even have been meant (such as someone disagreeing with you, or simply stating an unwelcome fact). It was originally created by tumblr user chardonnaymami, who used it in a post regarding a "virgin mai-tai". (Linked to an archive there because OP deleted the original post). 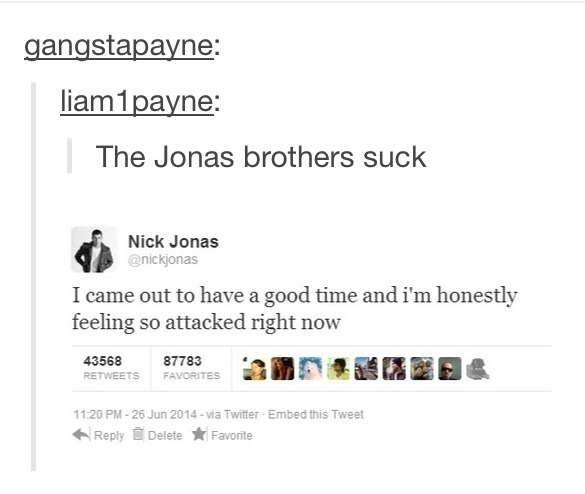 It quickly gained popularity after another user photoshopped the phrase onto a Nick Jonas tweet. Since then, the meme has seen widespread use across Tumblr with the warp and growth such things experience. 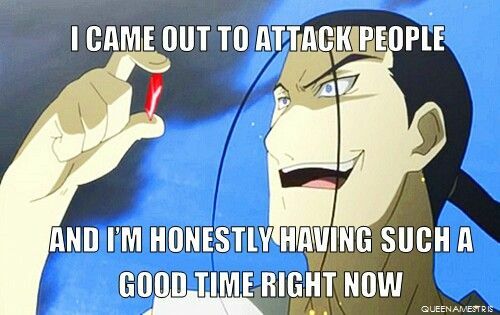 The best version, in my humble opinion, is of course "I came out to attack people and I’m honestly having such a good time right now," which is usually paired with the image of a villain from a TV show or movie Like this example with a villain from Full Metal Alchemist.